Custom-made Stack Pack and Lazy Jack to fit every type of sail boat. Drop and zip sail bags perfect for short-handed crews. Simply drop the sail into the pack and your mainsail is in place, safe and well protected from the weather. Horizon Sails makes two parts Sail Bags: mainsail bag inserted into the boom groove and a mast hood with zipper that completely protect your mailsail. Waterproof and breathable acrylic fabric MasAcril or Sunbrella in a wide selection of colours. This material lets moisture out and prevents mildew. Top quality UV resistant thread and seams. Zip on the top, along the entire length. The rigidity is ensured by 2 battens. 3 or 4 attachment points per side for the lazy-jacks. Mast bag (removable part around the mast) with zipper. Mainsail packs are built to last and protect your sail from dirt and harmful UV rays. The covers are individually cut and sewn with triple-layered seams and double stitching. The wear areas are reinforced. 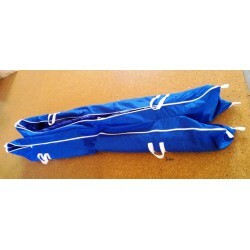 High quality custom mainsail cover made to fit your main sail, mast and boom. Reinforced wear areas at all cutouts to prevent chafe from your topping lift, Dutchman and Lazy Jack systems. Great design and highest marine quality components, hardware and webbing. The sail cover fastens around the mast with a strong zipper, covered and secured by a Velcro flap and web fastening system with quick-release clips under the boom. High quality acrylic fabrics in a wide selection of colours. This material is breathable which lets moisture out and prevents mildew. Mainsail-covers are built to last and protect your sail from dirt and harmful UV rays. The covers are individually cut and sewn with triple-layered seams and double stitching. The sail cover wraps around the mast collar and headboard. 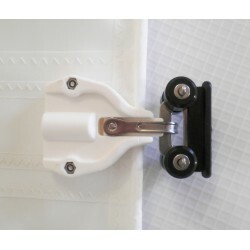 Buckle fastners on the bottom of the cover adjusts for a perfect fit. Custom built anti-torsion cable for top down furling and furling code sails. The anti-twist luff ropes are custom built to your length requirement. Anti-twist luff rope for flying sails furlers, Gennaker, Code 0 or Asymmetric Spinnaker. Our anti torsion ropes are custom luff lines specifically designed to be used for torque transmission without loss along the cable. 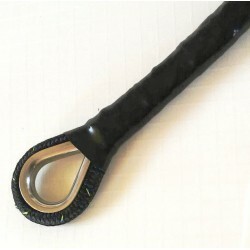 Anti-torsion rope has a unique torsional stability that transmits the furling gear rotation direct to the head of the sail. The rope adopts a triple fibre composite constructed to resist torsional forces from furling gear. It has a twisted aramid yarn core that provides the resistance to twisting. Our hardware sewn termination offers compatibility with all majors furlers brands. Spinnaker snuffer can be used for easy hoisting and dropping of spinnakers. The spinnaker is hoisted inside the sock and ready to be used. You will be able to use the sail in stronger winds, because you handle easily the spinnaker. The Spinnaker Sleeve gives you the confidence to sail in all conditions. Spinnaker sock is a device that allows you to use standard symmetrical spinnakers, asymmetrical spinnakers, cruising spinnaker. Our custom sock is sold with complete hardware and ready to sail. Spinnaker sock should be approximately 50cm shorter than the luff on a symmetrical spinnaker and the same length as the leech of a asymmetrical spinnaker. The spinnaker sleeve is very useful for small number of crew . It is used worldwide by short-handed crews, from the single handed around-the-world cruising to local coastal sailing. Pressure Absorbing Roller Slides. The slide efficiently handle the pressure exerted on the mast. You can instantly control your mainsail from the cockpit. Sun Cover Custom made Sun Cover, WeatherMAX® fabric. Very practical and robust. Long life resistance. Reinforced edges, stainless steel eyelets. Waterproof and UV resistant. Storage bag. Steering Wheel Cover Custom made Steering Wheel Cover. MasAcril® fabric. Pressure absorbing Roller Slides. Low Friction cart with 4 pressure absorbing wheels that bear on the aft face of the mast. 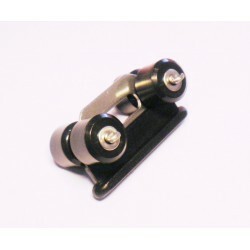 These universal roller slides can be used on most spars. Suitable for 4.5mm to 7mm mast slot. The slide efficiently handle the pressure exerted on the mast. You can instantly control your mainsail from the cockpit.